I am planning to build a 12.5x10 saferoom within my basement--utilizing 2 existing 12" block walls and building 2 additional walls. I plan to pour a 4" concrete ceiling. I plan to cut hole(s) into existing 12" block walls to support one end of the I beam, and likewise into the new walls. 1) should the beam run parallel to the 10 ft dimension or the 12.5 ft dimension? 2) is one beam all that is needed? Using Lou's example, I came up with S=1.6, and a W4x13 or W6x9 meeting the requirement. I plan to use 3/4 plywood and sheet metal for in-place form support. How many vertical supports and what spacing required during the pour? As you can see, I have much less S required for the load than you came up with. There are number of reasons as to why this is, one being the dead load that you used but it’s very less likely that the dead load will be much different. Based on my calculations, any steel beam I beam that you want to use will work. 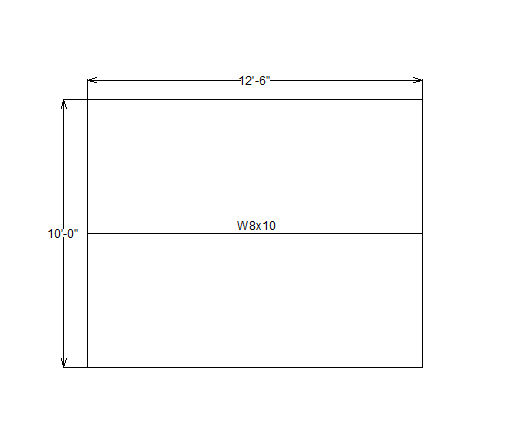 The 10ft x 12’-6” is pretty small for steel frame - steel in most cases are used for 20+ feet long span. answer: whichever way that will make the work easier. 2) is one beam all that is needed? answer: yes at the middle as shown above. I recommend 6 inch thick concrete slab reinforced with #4 rebar @ 12" each way. 3)How many vertical supports and what spacing required during the pour?